Malaysian metal fans, your dream has finally come true as Dream Theater is finally bringing their progressive metal and rock music to Malaysia this October. This marks the Grammy-nominated band’s first visit in Malaysia which will be part of their “Images, Words & Beyond Tour” in Southeast Asia, marking their 25th anniversary in the scene. Dream Theater is well known for the technical proficiency of its instrumentalists, who have won many awards from music instruction magazines. The band's highest-selling album is the gold-selling “Images and Words” (1992), which reached No. 61 on the Billboard 200 chart. The band’s current line-up includes John Myung, John Petrucci, James LaBrie, Jordan Rudess, and Mike Mangini. 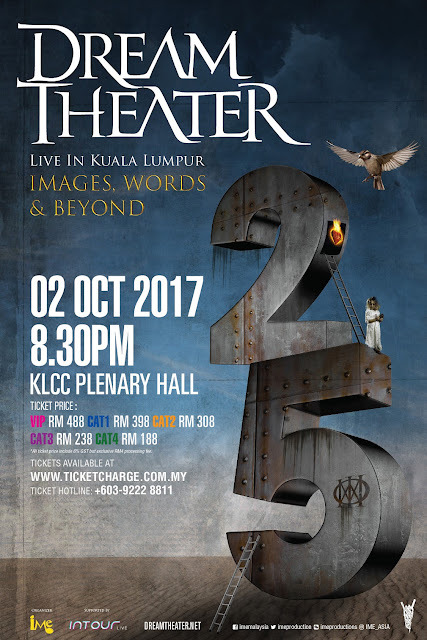 Dream Theater will be performing in Malaysia on 2 October 2017 at the Plenary Hall, Kuala Lumpur Convention Centre. Tickets are priced at RM488 (VIP), RM398 (CAT 1), RM308 (CAT 2), RM238 (CAT 3), and RM188 (CAT 4), which are available at ticketcharge.com.my. Dream Theater is a very popular bands nowadays. They have so many popular song. I like this band. I am also fan of metal band.